After another attempt to fix PB Jelly, I ran it again. Re-ran this using the BGI Illumina scaffolds FASTA. Default PB Jelly settings (including default settings for blasr). See the Jupyter Notebook for full details of run (see Results section below). Have added this assembly to our Olympia oyster genome assemblies table. This took an insanely long time to complete (nearly six weeks)!!! After some internet searching, I’ve found a pontential solution to this and have initiated another PB Jelly run to see if it will run faster. Regardless, it’ll be interesting to see how the results compare from two independent runs of PB Jelly. This entry was posted in Olympia Oyster Genome Sequencing and tagged assembly, Illumina, jupyter notebook, olympia oyster, Ostrea lurida, pacbio, PB Jelly, pbjelly, QUAST on 30 November, 2017 by kubu4. Yesterday, I ran PB Jelly using Sean’s Platanus assembly, but that didn’t produce an assembly because PB Jelly was expecting gaps in the Illumina reference assembly (i.e. scaffolds, not contigs). OK! This seems to have worked (and it was quick, like less than an hour! ), as it actually produced a FASTA file! 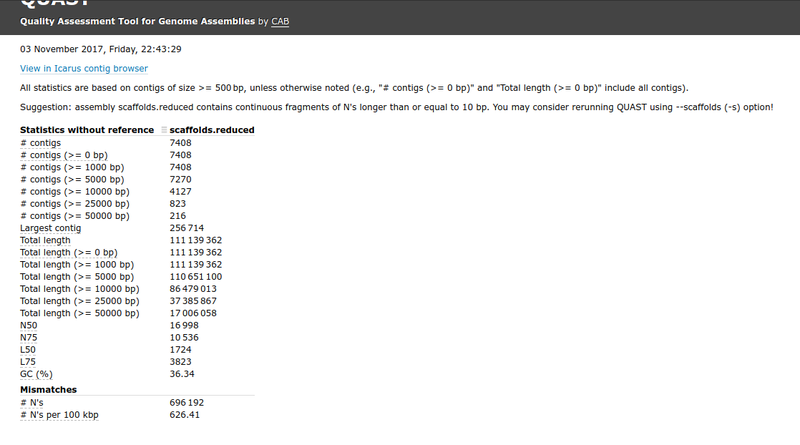 Will run QUAST with this and some assemblies to compare assembly stats. Have added this assembly to our Olympia oyster genome assemblies table. This entry was posted in Olympia Oyster Genome Sequencing and tagged assembly, BGI, Illumina, jupyter notebook, olympia oyster, Ostrea lurida, pacbio, PB Jelly on 14 November, 2017 by kubu4. Sean had previously attempted to run PB Jelly, but ran into some issues running on Hyak, so I decided to try this on Emu. This completed very quickly (like, just a couple of hours). I also didn’t experience the woes of multimillion temp file production that killed Sean’s attempt at running this on Mox (Hyak). However, it doesn’t seem to have produced an assembly! Looking through the output, it seems as though it didn’t produce an assembly because there weren’t any gaps to fill in the reference. This makes sense (in regards to the lack of gaps in the reference Illumina assembly) because I used the Platanus contig FASTA file (i.e. not a scaffolds file). I didn’t realize PB Jelly was just designed for gap filling. Guess I’ll give this another go using the BGI scaffold FASTA file and see what we get. This entry was posted in Olympia Oyster Genome Sequencing and tagged assembly, Illumina, jupyter notebook, olympia oyster, Ostrea lurida, pacbio, PB Jelly on 13 November, 2017 by kubu4. I followed along with what Sean previously did when installing on Emu, but it appears he didn’t install it in the shared location to make it accessible to all users. So, I’m installing it in the /home/shared/ directory. Luckily, I came across this GitHub Issue that addresses this exact problem. I found the functional URL and downloaded the hdf5-1.8.16.tar.gz file to pitchfork/ports/thirdparty/hdf5. Re-ran make blasr PREFIX=/home/shared and things proceeded without issue. As Sean noted, this part takes a long time. #This is the path where you&#039;ve install the suite. I went through all the stages of the test data and got through it successfully. Seems ready to roll! This entry was posted in Miscellaneous and tagged blasr, emu, pacbio, pbjelly on 30 October, 2017 by kubu4. Had problems with Docker and Jupyter Notebook inexplicably dying and deleting all the files in the working directory of the Jupyter Notebook (which also happened to be the volume mounted in the Docker container). So, I ran this on my computer, but didn’t have Jupyter installed (yet). This utilized the Canu contigs file (FASTA) that I generated on 20171018. This completed in just over 19hrs. Will add to our genome assemblies table. Ran Quast on 20171103 for some assembly stats. This entry was posted in Olympia Oyster Genome Sequencing and tagged assembly, canu, Illumina, olympia oyster, Ostrea lurida, pacbio, QUAST, redundans on 24 October, 2017 by kubu4. UPDATE 20171031 – This crashed. No plans to troubleshoot. Ran this on Mox (hyak) node. #these are the additional parameters to Celera Assembler. do not worry about performance, number or processors or batch sizes -- these are computed automatically. #set cgwErrorRate=0.25 for bacteria and 0.1<=cgwErrorRate<=0.15 for other organisms. I’ll edit config file to have standard deviations == 1 and try again. This entry was posted in Olympia Oyster Genome Sequencing and tagged Illumina, MaSuRCA, mox, olympia oyster, Ostrea lurida, pacbio on 19 October, 2017 by kubu4. I decided to run Canu myself, since documentation for Sean’s Canu run is a bit lacking. Additionally, it looks like he specified a genome size of 500Mbp, which is probably too small. For this assembly, I set the genome size to 1.9Gbp (based on the info in the BGI assembly report, using 17-mers for calculating genome size), which is probably on the large size. Additionally, I remembered we had an old PacBio run that we had been forgetting about and thought it would be nice to have incorporated into an assembly. See all the messy details of this in the Jupyter Notebook below, but here’s the core info about this Canu assembly. Well, this took a LONG time to run; a bit over two days! I’ll compare this Canu assembly against Sean’s Canu assembly and see how things look. This entry was posted in Olympia Oyster Genome Sequencing and tagged canu, jupyter notebook, olympia oyster, Ostrea lurida, pacbio on 18 October, 2017 by kubu4. Redundans should assemble both Illumina and PacBio data, so let’s do that. It wasn’t entirely clear how he had run Redundans the first time and the second time he used his Platinus contig FASTA file as the necessary reference assembly when running Redundans. Since he had produced a good looking assembly from PacBio data using Canu, I decided to give Redundans a rip using that assembly. 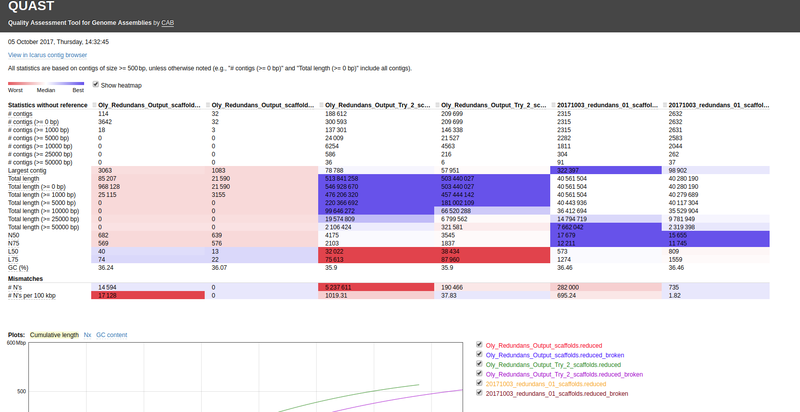 I then compared all three Redundans runs using QUAST. Notebook is also embedded at the bottom of this notebook entry (but, it should be easier to view at the link provided above). Using that Canu assembly with Redundans certainly seems to results in a better assembly. The scaffolds with the “Ns” removed from them are appended with “_broken” – meaning the scaffolds were broken apart into contigs. Things are certainly cleaner when using the --scaffolds option, however, as far as I can tell, QUAST doesn’t actually generate a FASTA file with the “_broken” scaffolds! This entry was posted in Olympia Oyster Genome Sequencing and tagged canu, Illumina, jupyter notebook, ostrea, pacbio, QUAST, redundans on 5 October, 2017 by kubu4. In this GitHub Issue, Steven had suggested I try out the minimap/miniasm/racon pipeline for assembling our Olympia oyster PacBio data. I followed the pipeline described by this paper: http://matzlab.weebly.com/uploads/7/6/2/2/76229469/racon.pdf. This notebook entry just contains the miniasm execution. Will follow with racon. This entry was posted in Olympia Oyster Genome Sequencing and tagged jupyter notebook, miniasm, olympia oyster, Ostrea lurida, pacbio, racon on 18 September, 2017 by kubu4.